When I crashed into our bed at the YMCA last Tuesday, I was exhausted from our 14-hour flight and hoped to sleep well. I slept very soundly for about five hours, but then I woke up. It was morning at home, and my body knew it and wanted to get up and have its breakfast. I tried to go back to sleep, but I couldn’t, so around 6:30 we showered and got dressed and prepared to go out for the day… dizzy, sleepy, but eager to see Hong Kong. After breakfast we headed out to meet Caroline, her friends Denise and Will, and about a dozen other of their relations. Denise’s family is from Hong Kong and Will’s is from the UK, so a large number of Will’s relatives had flown in for the wedding and Denise’s dad was showing them around. To this enormous party, we tagged along, and everyone was as kind to us as if we’d been actual friends of the couple! 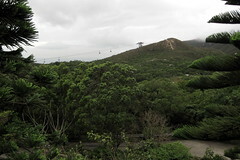 We took the MTR (the subway) and then a taxi to Lantau Island. How does one drive to an island from a different island? I’m still not sure, but Hong Kong has the efficient-transport thing down to an art (more on that later). 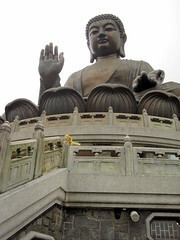 The big attraction on Lantau is the giant bronze Buddha, built in 1993 and located near a much older monastery. (We would have also liked to go hiking, but it was raining and the trails looked pretty secluded.) Many visitors like to take the cable car up to the Buddha centre, but I’m very thankful we didn’t — I’m not so fond of heights. The giant Buddha was quite awe-inspiring, and the misty weather shrouded all the surrounding mountains and trees in mystical-looking fog. We enjoyed spending time with Caroline’s friends and their families, and it was fun walking around the island. But the whole setup was just so touristy, it was hard to feel like we were involved in anything but a giant commercial transaction. Underneath the Buddha was a circular visitor centre. Inside, the circumference walls were lined with names and faces of people who’d passed on, and on shelves underneath the walls, well-wishers placed mementoes, food, and other offerings. But across from these walls, in the middle of the circular building, were souvenir stalls selling gaudy Buddha-themed trinkets. Outside the centre, it was the same blend of devotion and commerce. There were some visitors bowing and lighting incense, and this place was clearly a spiritual destination for them. Incense burners were all over the place. But there were also plenty of other people who were clearly just tourists, come to see yet another attraction in a foreign place. They took pictures, talked as loudly as they liked, and looked as out of place as we must have. It was kind of amusing, but I didn’t really like the thought of so many random people traipsing over these grounds without any feeling of reverence (including us, though I did try to be quiet). I guess people do the same thing in cathedrals and churches in the US and Europe. 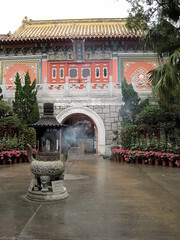 We had lunch at the Po Lin Monastery, a stone’s throw from the Buddha. I don’t think I always like Chinese vegetarian food. It’s not just the tofu; there are a lot of herbs and fungi I don’t like the taste of. After the lunch, Caroline and I visited the restrooms and encountered our first squat toilets, which was kind of funny. We walked into stalls, separately, and separately turned around and came back out, thinking, “I can’t do this!” Then we independently decided to brave it, and we went into our stalls again. It was my first public toilet in HK (aside from the airport) and I remember thinking, “You have to learn to do this! What if all the restrooms in HK are like this?” As I said yesterday, it really wasn’t so bad. When we hailed taxis to leave the island, it was very foggy outside; we could scarcely see the tops of the trees anymore. We sat quietly for the long taxi ride and then the MTR ride back to Tsim Sha Tsui. 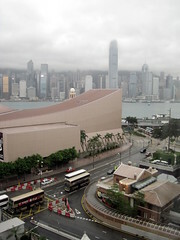 Wednesday is free day at the Hong Kong museums. (Which is pretty amazing, given museum admission is already extremely inexpensive — the art museum was only a bit more than $1 US.) By the time we got back from Lantau, we only had time to visit one museum, so we chose the HK Museum of Art because it was across the street from the YMCA. Joanna had warned us not to expect much from the museums in HK, and I’m not a big fan of art museums in general, but we were quite impressed and passed a very happy hour at this museum. Erik discovered the wi-fi network, Caroline liked this exhibit, and I was in total ecstasies over a permanent exhibit on Chinese accessories. 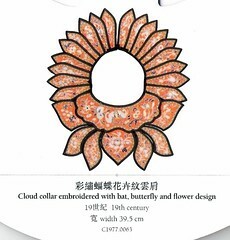 Shortly after entering the museum, I wandered into an area called Chinese Antiquities Gallery 2, where I saw a gallery called “Accessories.” I thought, hm, I wonder what that means. When I see “accessories” in a department store, I know what to expect, but I never thought I’d get lucky enough to find the same kinds of items in an art musem. 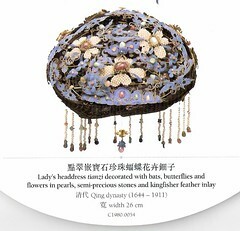 But no, accessories meant accessories: glorious cases and cases full of purses, hair clips, jewelry, belt buckles, fans, and scent holders, dating from antiquity up to the 20th century. I moved through the exhibit with leisurely glee, making sketches and gaping at the extraordinary artistry of all the pieces. I’m such a decorative-arts person… nothing ever makes me happier in museums than seeing furniture, clothing, accessories, and housewares. If I lived in HK I’d probably visit this exhibit regularly for inspiration. For dinner, we met Joanna in Times Square, which is near her office. When she told us Times Square I wasn’t quite sure what to expect, but it was very much like a condensed version of Times Square in New York, or Hollywood and Highland in LA. We enjoyed a delicious dinner and discussed plans for the next few days. We learned more about Joanna’s job, and she and Erik fought over the check (the waitress looked murderous — can she really not be used to this?). 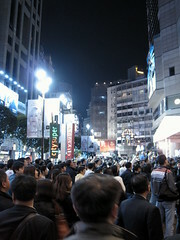 Then we went back downstairs to the plaza and found a giant crowd amassed in the center. Wow, it was exactly like Times Square NY or Hollywood! Joanna said there had to be some kind of celebrity in the center of it, and we navigated around the crowd to try to see. 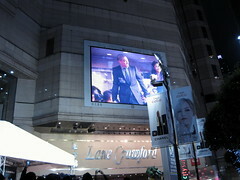 There was a JumboTron on the side of the building — a real, live JumboTron — and before long, megastar Andy Lau appeared to screams and cheers. Alas, the sight of him did little for us, but it was still pretty exciting that we just happened to see a HK star after dinner on our first night out. We walked around a little more, then returned home to sleep. 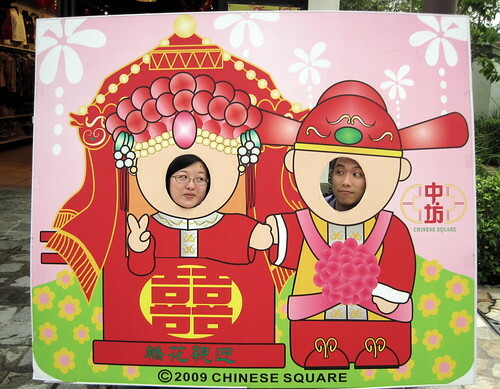 Tomorrow: high tea at the Peninsula, Japanese food, and getting a mini-facial in Cantonese, Mandarin, and English! Click to see the whole flickr album!